PA SYSTEM INCLUDES TWO PRO SPEAKERS, TWO SPEAKER STANDS, USB MIXER, HEADPHONES, MICROPHONE AND CABLES! Have you been struggling to put together a one-of-a-kind DJ entertainment system without over spending on your budget? It can be tiring looking at tons of different speaker and mixer options. Luckily, the DJPACK12 has everything you need all in one convenient package at a price point that can't be matched. 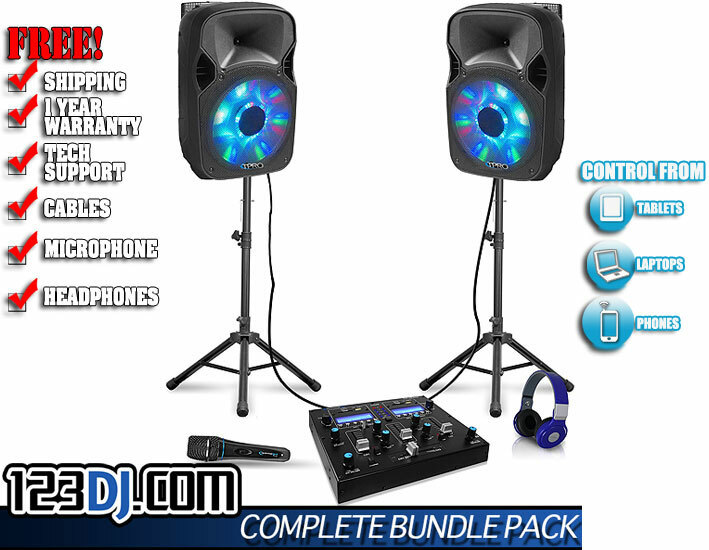 This professional DJ kit includes two full range 12” loudspeakers & glowing LED woofers complete with two tripod stands to give your party the feel and look of a popular downtown nightclub. Colorful LED lights inside the 12" woofers will coat your guests in vibrant colors as the bass resonates from their head to toes creating an experience they won’t soon forget. With the DJPACK12, the music will go on even if you don’t have a power source because of its built-in back-up battery that offers 3 hours of continual music play. Adding to its usefulness is the ability to play virtually any type of file including .mp3, .wma, and .wav files from USB drives and TF cards. The DJPACK12 speakers have a peak power of 1,350 watts for a combined force of an incredible 2700 watts! Rest easy that your guests will never stop partying as long as the music is playing. No true DJ kit would be complete without a full featured mixer and a pair of closed back swiveling headphones and the DJPACK12 delivers. It includes a microphone, headphones, 2 channel, LCD display Bluetooth DJ mixer, and all the cables you need to take it out of the box and immediately get that party started. There really is nothing else like this kit on the market making it a must have for any DJ. Whether you don't have all your DJ equipment yet or are in the mood for an upgrade, the DJPACK12 needs to be your go to choice.